I was going through my patterns today and one caught my eye, so I decided to pull the threads for it, and then I decided to to throw the threads on some linen and here is the result! 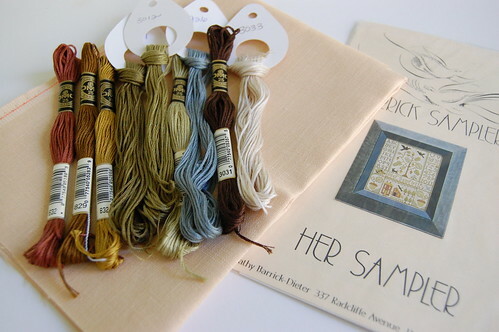 The pattern is an old one called "Her Sampler" by Kathy Barrick-Dieter from when she was designing under Barrick Samplers. The threads are DMC and the linen is 40 ct. Light Sand New Castle. I'm into 40 ct. again for some crazy reason! I also got a little bit more stitched on "Sea to Shining" I'm loving this one. 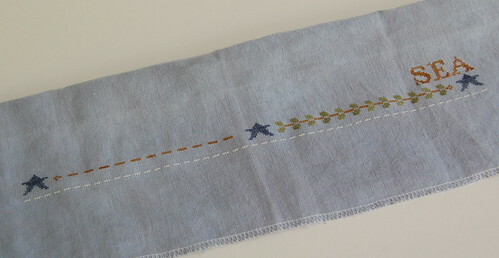 I love the linen and the silks are such a nice change from all the cotton I've been stitching with lately. It's so nice to be home! We had a rough trip going and coming back. I don't think any of the kids wanted to be in the car for eight hours! I was thinking of going down again for Thanksgiving, but after the last trip the thought makes me shudder slightly! :) Write later! I love how your Sea to Shining Sea is turning out - great choice on that fabric! Your Sea to Shining Sea is looking great!! The colors are just amazing!! Nicole, another yummy selection of flosses, linen and chart to stitch! Can't wait to see this one progress! Great progress on Sea to Shining Sea. I sooo love the fabric! I love that sampler - I've never seen it before. Enjoy Nicole...sorry about the kids and the car...I don't think that will change, ever...but the chance to see family is so inviting sometimes we'll do anything to be with those we love! :) Enjoy your new projects! This one will be gorgeous! Where did you get those cool looking floss holders? I can't wait to see more of your new project! Great floss toss for the Kathy Barrick-Dieter sampler and Sea to Shining is looking good.